These cookies were absolutely tie-dye for. See? I told you it was going to be bad. Now, if you can move on from this disastrous display of attempted wit, please continue to read about these colourful cookies. I figured such colourful cookies warranted the use of my homemade placemats as an appropriate backdrop. The rekindling of my creative cooking self was partly inspired by my passionate love of colour. These cookies saw me, once again, utilizing the ever-strong powers of my gel food colouring (well technically, it’s Brittany’s food colouring, but she was kind enough to let me use it for the summer). The recipe for these cookies was inspired by two different blog postings, one by The Cooking Photographer, and the other by my new favourite baking blog, Diamonds for Dessert. I’ve only made “icebox cookies” once before. To make icebox cookies, all you do is refrigerate the dough and slice it to make the cookies. For me, this refrigeration time lasted for two days, since I had absolutely no time to make them earlier in the week. I finally got around to baking them while I waited for my portobello pesto pizza to rise. Due to poor planning on my part, I decided to knead the gel food colouring into the cookie dough, rather than mix it in pre-flour when it would have actually been easy. 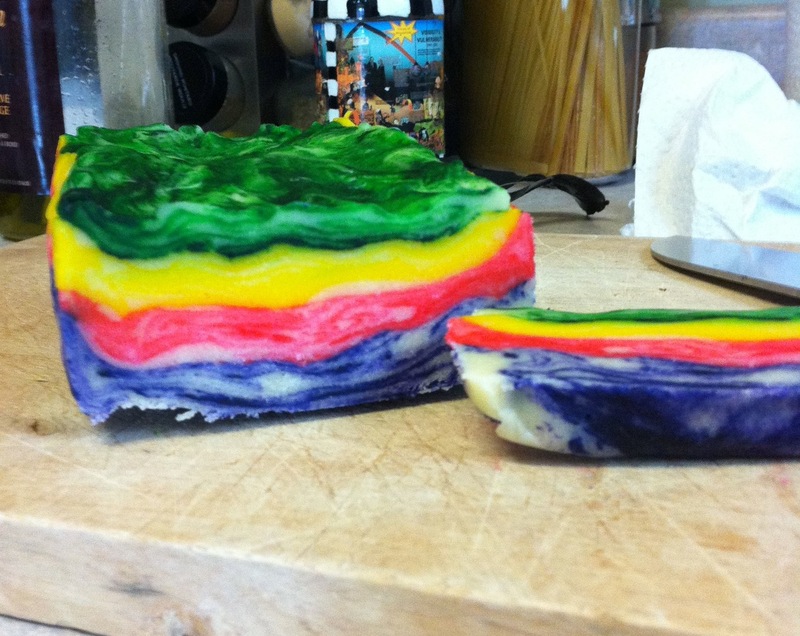 As a result, the dough wasn’t completely dyed, creating this sort of cool tie-dye effect. It also meant that my hands were dyed with pink, green, yellow and purple dye for three straight days. Gel food colouring – it’s powerful stuff. (PS: in my recipe below I’ve changed around the instructions so you can get solid cookie colours…unless you want to make them look tie-dye, that is, in which case add in the food colouring last). My favourite part of photographing these cookies, was that a little girl strolling along the street with her mom stopped and stared for a bit. Something about rainbow-coloured cookies make kids coming running. I gave her a her mom a cookie and snapped their picture just because the kid was so damn cute. I also happened to be a fan of her pink colour scheme. I already have a few tricks up my sleeves for the next time I make cookies like this. I’m thinking of making two layers mint green and adding in peppermint extract instead of vanilla. The other two layers will then somehow have oreo crumbs mixed in, making them either (a) like a girl guide cookie or (b) like the best Dairy Queen blizzard in existence. Stay tuned. Cream the butter and the two sugars together with a mixer or a large wooden spoon. Mix in vanilla extract. Spit what you have so far into four different bowls. Add a little food colouring (seriously, you don’t even need 1/4 tsp, these dyes are so powerful) to each bowl (see gif image above) and mix until batter is bright and colourful. Add an equal amount of the remaining flour to each bowl. It will work out to be 1/2 cup + 1 tbsp of flour if you have four different bowls of batter. Mix just until a dough forms and no flour streaks remain. Press the dough, one colour at a time, into a small, wax-paper lined loaf pan. You should be forming coloured “layers” with the different bowls of batter. The picture of The Cooking Photographer blog (see link above) best illustrates this. Refrigerate dough in pan for at least one hour. Once the dough is firm, remove from the refrigerator. Slice 1/4″ thick slices from the dough rectangle. Slice the piece in half and place the cookies onto the baking sheets. This is what my dough looked like when I took it out of the fridge. Cook on parchment paper lined baking sheets at 325°F for about 12 minutes, or until cookies are no longer oily looking on top. Thanks Alyssa, they were rather tasty :). Also, I love these placemats too – it’s a shame I don’t have a kitchen table to put them on yet!